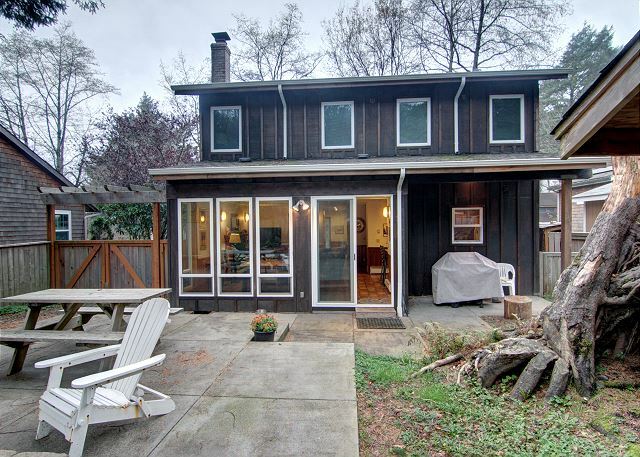 Sea Pines is a great pet-friendly, two-story family home located in the midtown area, one block from the beach-access stairway across from Haystack Rock, and a short walk to the infamous Sleepy Monk coffee shop. The convenient front entry directs you either into the living area, the master bedroom, or upstairs. Moving straight back into the living and dining areas, the knotty pine and white open beams create an open beach-y atmosphere. The living area features a wood-burning fireplace inviting cozy gatherings, while the dining area enjoys the advantage of spacious window-light and slider-door access to the back yard and patio area. The roomy and well supplied kitchen flows from the dining area and seats two at the counter. The master bedroom with a King sized bed, a bathroom with shower, and a full sized stacked washer and dryer are also on this level. The upstairs opens into an open loft, providing a comfortable seating area and Full sized bed. Off the loft area are two private bedrooms, one with a King bed, and the other has a Queen bed as well as a set of bunk beds. The bathroom on this level has a tub and shower. One of the best features of this property is the secluded back yard and patio area. Enjoy a nice escape dining open-air or relaxing around the fire pit. "It was wonderful being so close to downtown cannon Beach. We were able to take our dog, and our children with enough room for everyone. " "The Se Pines was a wonderful place to stay for us. The space in the home was perfect for us, and we were able to bring our dog. We walked everywhere we went. It was so close to the beach, we loved it "
"We have rented from CBPM for several years and they are always extremely helpful. " "Our extended family has stayed at Sea Pines several times and it is a great fit for us; There is plenty of room for our 5 adults two children and dogs. Our visit there is our favorite week of the year!" "We loved the house, it was perfect for our large family. We look forward to coming back next year!" "The cabin is extremely well appointed. It is very comfortable and spacious. The beds are awesome, allowing for restful sleep after a day of hiking." "We've stayed in this house the year before as well and it worked out perfectly for us and our 4 adult kids & their significant others. Plus our dog and their dogs(grand dogs). On a quiet street but conveniently located to beach and restaurants. Also close to town for us walkers." "We had a great time at Sea Pines. The house had plenty of room for a family of 4 and could easily accommodate 2-3 more. Located on a nice, quiet street but still close to the beach and the southern edge of "downtown". Only real negative... We didn't have much in the way of cell phone reception inside or outside for some reason (we had full bars on the beach, go figure). But the whole point of going to the beach is to escape, right? :)"
"The house was perfect and exactly as described. Our wedding was at Surfsand Resort/Haystack Gardens so it was only a 5 minute stroll. The only thing that I can say is the downstairs King bed was broken and caused me to have terrible back problems. We mentioned it to the property mngt so hopefully they fix it. Also, we had the police come to the door due to the fire pit in the back yard. We were told it was a no burn time on our second to last night- had no idea and we would have been bummed if the entire trip we couldn't enjoy the back yard. Other than that it was a great place!" 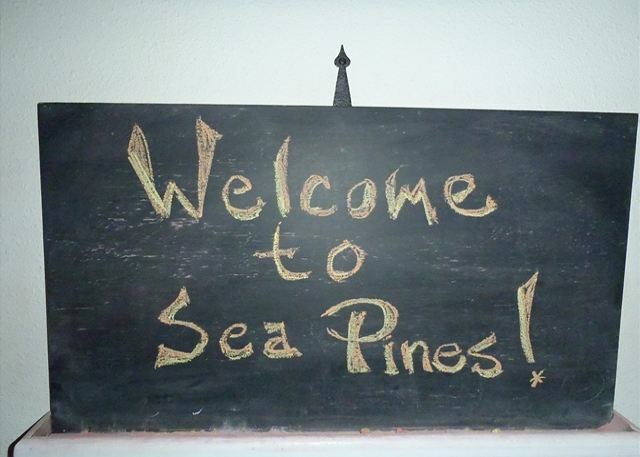 "We thoroughly enjoyed our 3rd stay at Sea Pines. The house is very spacious, well-maintained and more than enough room for us (5 adults, two children and dogs). The beds are comfortable, kitchen well-stocked, fenced yard for the dogs, close walk to our favorite coffee place. Hope to stay again." "The Sea Pines is a comfortable, clean and well equipped rental that is very convenient for walking to Haystack Rock, great coffee house, restaurants and shopping in town. Nice fenced yard that our little dog enjoyed and a fire pit for s'mores in the evening. My family loved it and will be back. Only thing that could have been better was the outdoor/patio furniture." "We really enjoyed the house with 6 adults and a bunch of dogs! Everything you needed was in the kitchen so much stuff in the cupboards that it was hard to put food in them. The yard with the patio and fire pit was fun for everyone. Conviently located to beach and the really nice coffee place." "We had a wonderful stay. Plenty of room and clean. Even dog bones. Thank u so much. We are already talking about next year. "This was the 2nd time we rented this home. It is a great home for a Cannon Beach vacation. Very roomy & comfortable for a family. Very clean, & easy walk to the beach as well as in town for shopping & meals. Would highly recommend this to friends or family." "the kitchen was the best stocked I've been in! pans of every size, plus tons of mugs, glasses, plates, wine glasses! the table was big enough for 8 people, but there were only 5 of us. beds were excellent. there were a lot of towels and space in the bathrooms. we could easily walk into downtown or the beach." "Relaxing, nothing to worry about. Came in late and the keys and information was where they said it would be. They had Dog bowls, leashes, and doggie bags in the foyer. Also had a bottle of Champagne and doggie biscuits as a welcome. It was very nice to get away and relax. " "Clean, updated, cozy and well laid out for our family gathering." "Really enjoyed our stay at the property and loved the fact that it was within walking distance to several shops, restaurants, cafes, and, of course, the beach! a few quirks with the place to mention- several of the electrical outlets are very loose and the stove knobs need some repair, but overall a very nice house." "Great location and nicely updated home. Lovely family room and kitchen. Nice and roomy. The only complaint we had was that the downstairs master bed has broken springs on one side and creaks loudly. " "We found this property fairly late into the year. As it turned out it was a great find, good location with everything you need"
"Sea Pines was a lovely home. We thoroughly enjoyed our stay. Thanks for another great vacation!" "Great house, well appointed, comfortable, and perfect for the week. Beds were great, and layout was perfect for what we needed, for both adults and children. " "It was great to have the firepit at the back. The house was spotless and really great. The kitchen had everything you could ever want. I've been to numerous rentals for vacation homes and this is one of the best stocked kitchens I've seen in terms of quality of cook ware. " "Had a wonderful stay. Great weather and the vacation rental was very nice." "Perfect for a couple with two teenage boys, grandpa and a dog. We spent three nights here and there was plenty of room for everyone to spread out. The open floor plan with fireplace was a great spot to hang out and play games or watch a movie in the evening. There is also a quiet spot upstairs with natural lighting for those who want to get away and read a book. We cooked all of our meals at the house. The kitchen was very well equipped with everything we needed including a gas grill. It was an easy walk to both the beach and downtown. We would defiantly stay here again. Thank you for the perfect getaway!" "House was great, location excellent. The only suggestion I have is to send someone over to turn up heat before arrival. The house was very chilly and took a while to warm up. Would definitely stay there again!" "There were eight of us who stayed here, just for a weekend. At one point, the kitchen lights stopped working, but management sent someone out right away and had things fixed. The kitchen was great, beds were nice, everything clean. The only thing was that the back fence is not complete, so if our dog was the type to run off, we would not have been able to have her out there." "We enjoyed our stay very much! Sea Pines was a nicely laid out house and a good fit for our family. The location was good with a fairly short walk to the beach and the entrance on the beach is right by haystack rock. We have rented houses through Cannon Beach Property Management several times and have always been completely satisfied!" "Sea Pines provided everything we needed for a relaxing weekend away--and we are all serious cooks. The kitchen is well equipped and the house spacious and comfortable, especially for the price." "OVerall we enjoyed Sea Pines home. 5 of us enjoyed the large living room and kitchen/sitting area. beds were adequate. A few things I would of liked: a fenced back yard for my dog (there is a small dog run on the side of house though that is fenced in). Location was great off the main road so it was fairly quiet. The kitchen was missing pot holders and the coffee maker was broken (they replaced). I was surprised by the limited food items in kitchen (salt/pepper and some old olive oil- many other homes I've rented usually some condiments left from previous owners) so make sure you bring everything including the mustard. They had a nice set of pots and pans and silverware. The back sliding door was difficult to open, and unfortunately the garbage had not been picked up curbside when we arrived, so the can was completely full. Short walk to midtown shops and downtown area was nice. Overall nice place. " "We had a wonderful time. The cottage had plenty of room for our family with an excellent backyard space. Walking to downtown only takes 10 minutes with Haystack rock literally across the street. Highly recommend this property." "This was our second stay at Sea Pines, and we had a wonderful week in this spacious, pet-friendly home. We hope to stay there again~"
"Great Location And Property, Will Come Back." "Although not beach front, this was a great location. close to great coffee at the Sleepy Monk as well as Fun Cycles rental--really fun to ride these on the beach. Great for adults and kids. Also we were just a few minutes walk to the tide pools of Haystack Rock. The sleeping arrangement in the house was nice. My husband and I were on the second floor with our 2 boys, and my in-laws had a bedroom and the bath on the first floor. Comfy couch for relaxing at night or a rainy afternoon. Kitchen furnishings adequate for cooking in. Would rent it again"
"It was a beautiful home that we stayed in and met all the needs of my family for the trip. This was our first ever visit to Cannon Beach. The Good: Great open floor plan with large windows looking out to the back patio which brought in lots of natural light. 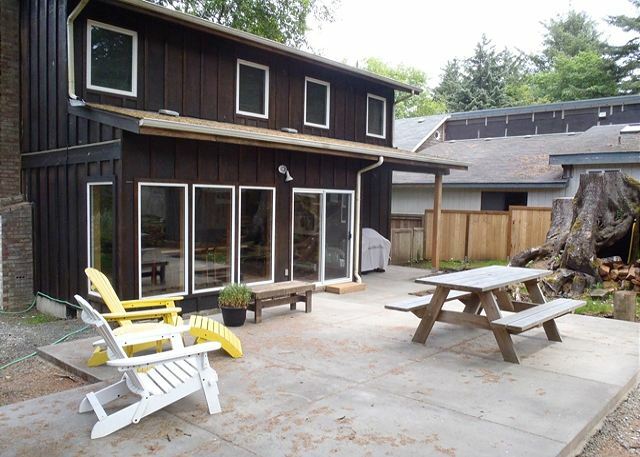 Good location and walking distance to the beach, Haystack Rock, and downtown Cannon Beach. I loved that it accommodated our pets and had plenty of towels. The check-in and check-out procedure was easy. There was free secure wireless internet with a good connection, TVs in three areas of the house with basic cable, and a washer and dryer in the house. The Bad: The upstairs bathtub had a leaky faucet, old showerhead, and there was some kind of leakage around the bathtub as we later found out. A knob on the stove was broken and only two of the burners worked, but it was okay because we didn't need all of them. The screen door of the sliding door was a little hard to open. One of upstairs bedroom door knobs was broken and the beds were kind of hard. I don't think any of us had cellular service (T-Mobile, AT&T, Sprint) in this area and had to go to Seaside for bars. Appliances were outdated, but still fairly functional. The walls were VERY thin so when grandma woke up at 4am we could hear everything and all conversations downstairs in the early morning hours. At night there was less privacy because there were no blinds or curtains on the large windows in the living room downstairs. Overall, none of the bad things were enough to keep me from renting the same property again. I really liked the house and it became home for our stay. It rained all three days when we were down there, but that didn't stop us from enjoying the 15 minutes of sun here and there. We plan on coming back when the weather is nicer!" "This was a perfect house for us and spotless when we arrived. Everything was there and we did not need anything. Ok, maybe beach towels if it was in the summer but that was the only thing I could think of that was missing. A wonderful stay. We made it to the beach several times so it was close enough, but a bit closer would have been better, but we knew that beforehand and the price was so reasonable. " "The home was very nice. We could not have chosen a homier place to spend our family holiday. We all enjoyed our walks on the beach and in town. We liked supporting the local businesses and are looking forward to another visit." "We ahd a great time. We have rented several trimes from CBPM and have had our expectations met each time. This house was in town, but close walk to beach and shopping. Teh great thing was the kids never enve tunred on the TV...we played board games and built two puzzles instead, all around a cracking fire....smores we made, and peace prevailed. My idea of time away....."
"We loved the house and the fireplace, you seldon see wood burning fireplaces anymore, they are so cozy, but our dog was terrified of it. Go figure. We would rent it again." "Spacious home, great fireplace, lots of windows and light. Near mid-town Cannon Beach--~5 min walk to Sleepy Monk, ~10 min walk to the beach, just across from Haystack Rock. Only downside was the small-ish backyard; not a concern for us as we were out an about, but if you need a big backyard, this one's not. Also, didn't bring the dog this time, but dog run fence is pretty low--our Aussie/beagle mix would be able to jump it. " "We loved our stay at sea pines! Short walk to haystack Rock and the beach! Close to shopping and restaurants! Would stay again!" "Our family had such a wonderful week at Sea Pines. Plenty of room for everyone including the dogs who had a great time. This comfortable home has a well-stocked kitchen and all the amenities including wi-fi and a great TV. We hope to return! " "Sea Pines was a great house for our family of 6 adults. The inside was larger than it looked from the outside. The location to town was very good and a quick walk to the beach. We loved having our dogs there with us, though the back yard needed some work. We look forward to returning to Cannon Beach in the near future and would certainly consider this home again." "We only stayed two nights, but it was a great house. Much bigger than it looks in the pictures. My grandson was so excited about sleeping in a bunk bed! Only slight disappointments were no gas barbecue and difficult walking access to the beach. " "Our family with 3 kids was happy upstairs with plenty of room and a nice bathroom. However, the grandparents were not as happy with the downstairs. The living room furniture was very uncomfortable with its huge couches, no chairs and only one lamp for reading. The kitchen and dining area were nice. The backyard needed a lot of attention." "for our family: mom, dad, 2 teenage boys + 1 friend of the boys. The 3 boys "took over" the upstairs and it seemed to work out fine for them (and us!. Lots of room in this house--larger than the pictures! House is in a quiet neighborhood, not too far from the beach and a nice walk into town. We would definitely consider this rental again." "We had an excellent time at your home. The house was very cozy and comfortable. The kitchen was extremely well stocked and delightful to cook in. We had a great time on the beach and would love to stay there again in the near future." "We had a lovely bridal shower weekend with 7 ladies at Sea Pines. The place was spacious enough for all of us to feel like we had room to breathe and move, but cozy enough to feel like a real beach get-away. It was wonderful to be able to walk to the coffee shops and the beach. The kitchen was well-equipped and the large couch was perfect for all of us on movie night. It was too chilly to be outside, but the backyard has a great set-up for outdoor dining. Would love to come back in the summer months! The dog had a blast, too :-). " "A very comfortable, pet friendly family home." "the cottage was wonderful. Very well stocked and maintained. We were there on a blustery weekend and having a real fireplace made the week end so much more enjoyable." "The house had comfortable couches situated perfectly in front of a fire place. The open-air format with no walls between the kitchen, living, and dining rooms was a plus for a family-oriented stay....could keep an eye on our infant without being in the immediate vicinity. The main draw back was the uncomfortable beds upstairs (mainly, due to mattresses). " Beach Property Management. They treat us great. We usually get in late, but they have the key waiting for us and we can check in the next day. The places are always very clean. We love Cannon Beach and tell everyone we can about staying there." "We had a great stay. Wish we had a little less rain. The house was great. Had everything we needed. " "We really enjoyed our stay at the Sea Pines and Cannon Beach was wonderful once again! " "Although the weather was not good, we enjoyed our weekend at Sea Pines. We were able to walk and play on the beach between showers. The Sea Pines home was very nice, comfortable and cozy." "We shared this house with 2 other families and were surprised at how well it accomodated everyone. This place is bigger than what the pictures indicate. We had a great time!" "This house was the perfect venue for my family's reunion. It was clean and comfortable. We really enjoyed the fireplace and the easy walk to the beach. Also, it was surprisingly quiet at night with very comfortable beds. There was plenty of room for everyone." "We were able to relax with our daughter and her husband and three children with enough space to relax and spread out!" "I've been coming to CB my entire life, and we usually stay in hotels. But recently I came across the CBPM, and boy was I missing out! For the same amount of money, we could rent a HOUSE instead of a room (or two). The staff was very nice, and the house was perfect. Easy access to town (whether your walking or driving) and very quiet! Not entirely fenced in for a dog, though there is a small fenced kennel on the side of the house (not covered, so we couldn't use it for our dog cause it was RAINING). The house was equipped with an army of silverware and board games, which we played with every night. Plenty of space and will definitely use again--maybe even next month." "This was our first family vacation in four years and our first time renting a home, as we usually go camping. We were not disappointed! The house was much bigger than we anticipated and the kids loved having their own rooms. The living room area was huge with a nice flat screen tv and fireplace. The kitchen had everything we needed. The pictures on the webpage don't do this home justice. I would definitely go there again!" "The house was great, roomy and well stocked. It even had dog towels and dog toys! The down side was that beach access was further than anticipated and I could not use my cell phone (AT&T)." "We usually stay at ocean front properties, but all we could get on short notice was Sea Pines. We were pleasantly surprised with the open, generous floor plan for a small cabin. The view out the back is treed and feels private. The bedrooms and bathrooms are spacious. Cozy fireplace and the dining area has a nice view of the backyard and forest. Only things that would make this rental better would be a better stocked kitchen (carrot peeler, tea pot, napkins). We had a pleasant stay and it is an easy walk to the beach and shops." "The photos of this home do not do it justice. Fabulous home, great location, very quiet street but you could still hear the ocean. This is the fourth house we have stayed in at Cannon Beach and I would have to say that this one is our favorite!" "Very Spacious, Clean, Extremely Pet Friendly, Cute backyard, Quick Walk to the Beach and Haystack Rock. The office staff are very pleasant. We would stay again." "Our entire family enjoyed our stay and created more memories. Even our dogs enjoyed their stay. We would highly recommend this house. Thanks for the great time"
"We spent three nights here in March 2010. We had two dogs and four kids and everyone fit just fine, plus we could walk to the beach only a couple of blocks away - or walk to nearby restaurants and shops. Really likes having firewood ready to go and all amenities. Internet was provided, but could use a wireless router. Thanks! Andy"
"Roomy house, fireplace was wonderful. Quiet neighborhood." "This house is very comfortable and easy. convenient location and the upstairs is great if you have kids and/or other guests. Plenty of room and easy to keep clean (no white carpets!!!) Decor is beachy and comfortable. We were there for a long stay and found it to be very relaxing." "We had a great time and all my family members enjoyed the open feeling of the house. There were a couple of spots on one of the carpets obviously due to dogs, but we had wanted a dog friendly house even though we didn't end up bringing our dog. We had plenty of supplies for washing dishes, etc. It was close to our favorite part of the beach, and we were able to walk to town,etc." "Location is great. Easy walk to beach. Dirty dishes in cupboards - figure prior houseguest accidentally put dirty dishes in cupboard rather than dishwasher. We have stayed here before and will come back for third visit. Great house - Ample room upstairs for multi family and kids. " "We had aa delightful time. The house was wonderful. It was perfect for our family. We would certainly use your services again if we are in the area. Thank you." "Sea Pines was great! At first we were worried that the house would be too cramped but there is a lot of room and the Kitchen/Living area is a wonderfull common area. The local is great because you are basically across the street from Haystack Rock and only a 10 minute stroll to downtown plus you are just off of the second highway entrance so getting in and out is a breeze. The one downside is the yard or lack of, but with the beach so close it wasn't a big deal." "We stayed at Sea Pines with 3 teenagers and our dog over spring break. There was plenty of room for everyone and the kitchen was well equipped for cooking meals. The property is on a quiet street with a small back garden and easy walking distance to the beach. The weather was rainy and stormy most of our stay and we had fun playing some of the board and dice games. I would definitely stay again"
"We were looking forward to a family Christmas with the whole family convening in Cannon Beach. While we could have all stayed at my daughter's, I decided more space was needed. Imagine how thrilled I was when I found out that Sea Pines was next door to my daughter's. We were extrememly happy with the house and have many memories of Christmas 2008." "Only thing I would have changed: Check out time Sunday @ 11 seemed rather early. " "We had a wonderful stay at Sea Pines. It is walking distance to almost everything, and the home is a great place to gather." "Only suggestion for Cannon Beach Property Management is to shorten the lead time for changing or cancelling a reservation. Otherwise everything was great. Thanks!" "Our family has rented many nice homes with CBPM, we have always been pleased!! This house however was incredable!! We had such a good time that we are planning to ask for this house from now on! This was my girls first vacation ever and they had such a wonderful time that they cried when we had to leave!! Being in this house made Easter morning so much brighter for them! The ladies in the office were very nice and easy to deal with as well. They allowed us to check in early as well as check-out later. I have recommended this company to everyone I talk to about vacationing on the Oreagon Coast. Thank you again for a wonderful visit!!!!"